Prominent & Leading Manufacturer from Pune, we offer actipak desiccant strip. 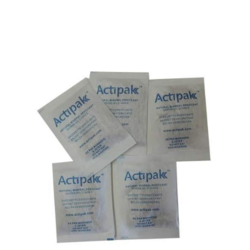 We are counted as one of the leading manufacturers and suppliers of the best quality of Actipak Desiccant Strip. Known for its high absorbing capacity and innovative design, the offered container desiccant strip is manufactured as per the industry laid norms. Due to our large production capacity, we have been able to take and complete bulk assignments of desiccant strip. Looking for Desiccant Strip ?